Crop circles made of stone. That’s all I could think of as I reached the top of the mountain and looked at the landscape in front of me. There was no doubt in my mind that these were not made by aliens. I’d been walking on these rocks with difficulty, for hours . 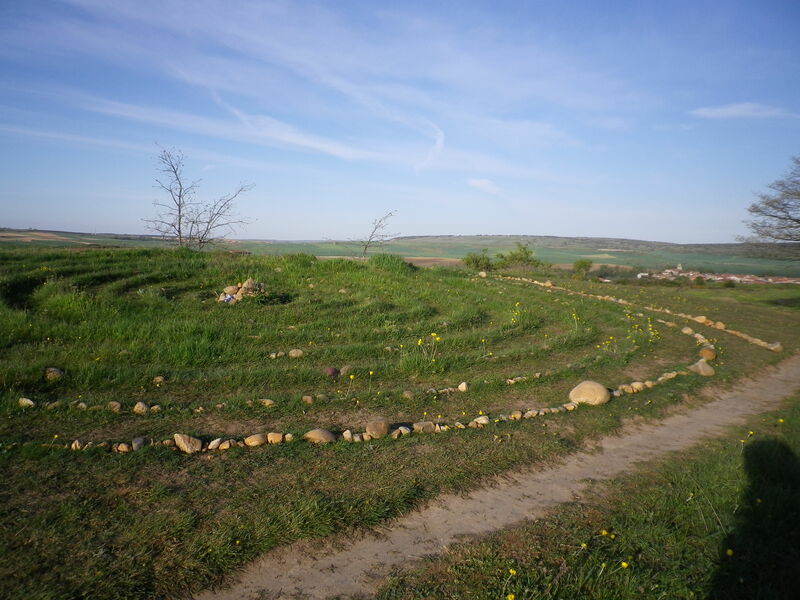 But I had to wonder who had the time to gather all the rocks and arrange them so meticulously in so many circles. They were large and there were many. There were no houses or villages so high up and so close to the city. Someone had spent their time creating art, and I was grateful. Stone circles here, stone circles there. Many, many meters across, with ripples of stones radiating from the center of each one. But they did leave me wondering – who had had the time? Greg and I met a couple from Germany who were returning from Santiago on bicycle. They were kind and friendly and shared a poem with us (this is the kind of thing that happens on the Camino)). And they gave detailed directions on how to get into Burgos. It was heading into siesta time. The time of day when the heat forces all of Spain to close shop and wait for the more survivable time of day. We stopped in a bar along the way to Burgos and got a much-anticipated cold beer. In fact, two cold beers. Large. What would my children say if they saw me gulping beer before noon? 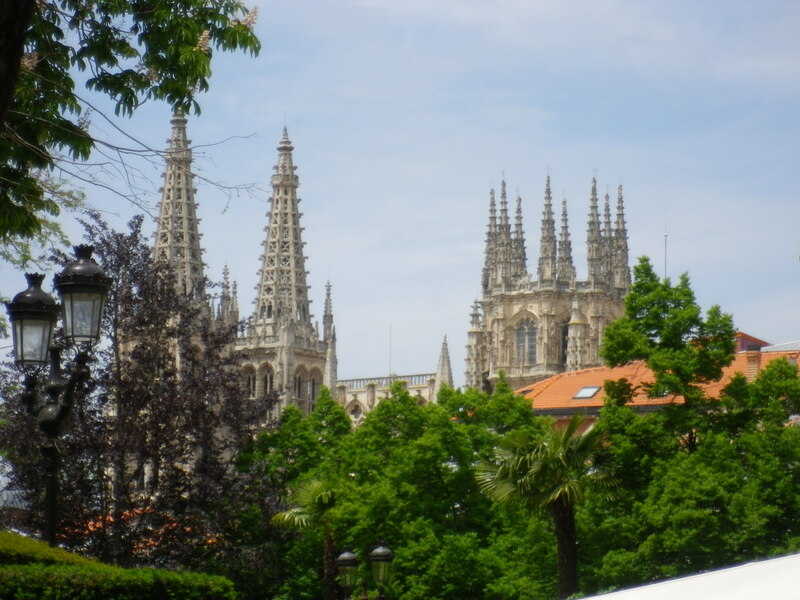 I planned to spend two days in Burgos so I was anxious to arrive. I left the bar and began my walk into town, which meant a long, dusty, hot walk around the airport. 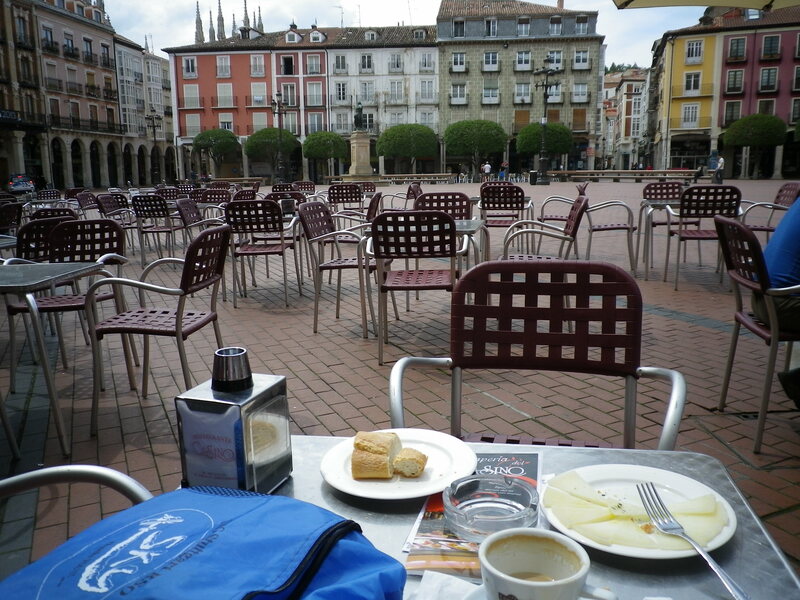 No one else had been nuts enough to take off at that time of day so I had no one on the Camino to follow. I followed the arrows and remembered the advice of the German cyclers. This was the city, so the pavement was very hot under my feet. After about 20 minutes, I looked back, as I often do, to see how far I had come. Imagine my surprise to see that I was being followed by a dozen pilgrims. I knew they were all following me. Traveling singly, heads down, barely looking ahead, you get into the habit of simply following the peregrino in front of you and crossing your fingers that he/she knows the way. Now, they were all following me! I hadn’t decided whether to take the city bus into the center of the city or to walk all the way. The guide-book says to take the bus, it’s short, cheap, and the walk into Burgos was through the unremarkable industrial part of town. When I met two young local girls, I asked where the bus stop was, wanting to make sure their information matched what I had in the guidebook. It did not. They gave me other directions, which they claimed were more accurate than the book. With so many people following me, I felt responsible to make the best decision. I decided to take the city bus and to follow the girls’ advice. Some of the pilgrims followed me to the girls’ bus stop, some went by the book, and others decided to walk all the way and not take the bus. I had a nice conversation with a local woman waiting at the bus stop and in ten minutes, the bus arrived to take us into town for a euro. We passed the pilgrims who had decided to follow the book and were still waiting. I had made a good decision. Who insults a Saint to their face? I met a delightful Canadian named Greg who was a great companion. Funny, slightly limping, he was just what I needed for the day. We stopped at a truck stop and had the best bocadillo of the Camino, huge tuna and tomato on ciabatta style bread. Delicious beyond words. We looked back from the top of a challenging climb and saw the snow-capped mountains we had been walking around. It was sobering to see how far we had walked and note that, although it was hot where we were, the snow still had a stronghold in the heights we had passed. Tiring of limping, Greg invented the latest thing for pilgrim comfort – one piece socks and sandals. I know socks and sandals are the plague of beaches everywhere, where fat old men insist that they must wear socks with their sandals and shorts on beaches and boardwalks around the world. On the Camino, socks and sandals are the height of fashion and blister relief. How low can your fashion sense go? Roll up your pants, hang your sweat-filled socks off your backpack, and balance a hiking boot off each of your hiking poles. This was how we happily trudged into San Juan de Ortega. We even did a rendition of “Bohemian Rhapsody” while climbing up one pathway. We were in great spirits as we made our way in the tiny town of San Juan de Ortega. The entire town consisted of the Church, the albergue, and the cafe. Nothing more. Stone and wood, a typical albergue, I made the final climb to the second floor, found a bottom bunk and dropped my stuff. I washed my clothes and put them to dry on the stone wall, using solar energy once again to speed up the drying process. My standards had, admittedly, sunk quite low. 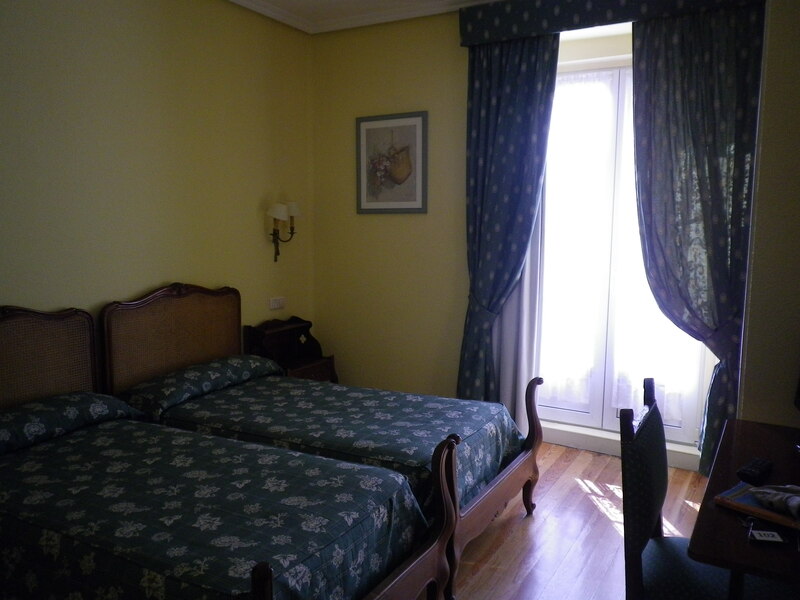 But I hadn’t found this albergue to be much worse than other places I had enjoyed, so I had been pretty comfortable. And the Church at the end of the plaza contained the actual remains of the Saint, San Juan de Ortega. The are many legends and stories along the Camino and each town has its own special story of the Saint whom their Church is lovingly named after. A relic, a miracle, the stories are part of the fabric of the community. But here there was no legend. It was fact. San Juan de Ortega was a disciple of Santo Domingo and, in this very isolated and difficult setting, brought comfort and safety to peregrinos making their way to Santiago. He was the driving force behind the building of bridges, roads, and buildings for pilgrims on this part of the Camino. Many pilgrims would not have been able to make their way to the end without his dedication to them. His remains are in the Church in a simple stone sepulchre, tended gracefully by the local parish priest, who gave a moving blessing to the pilgrims who gathered for the pilgrim Mass. Yes, the albergue was run down and could use many improvements. The bathrooms needed an overhaul. There was no store (there is no town) so all had to eat in the small cafe next to the albergue, a cafe which only held about 20 at a time and many pilgrims had to wait to be fed. The rooms were crowded and dark, the bunk beds rusty metal. Yet, the mattress was soft and clean, a blanket available to those who needed. The floor was swept and we all made due with the limited space of an albergue. The price of bed and shelter from the elements was ridiculously low. I suggested to this person that her assessment was a little harsh but she told me that she was going to brush her teeth outside with bottled water because her friend told her the bathroom was so dirty. Greg and I looked at each other and shrugged, found dinner companions, and had a good evening. But I continued to feel bad because this person had, in a way, insulted the hospitality of the Saint, a saint who was resting right across the plaza in the Church and who had made it his mission to provide for pilgrims. He was dead. It wasn’t his fault time had not been kind to his life’s work. 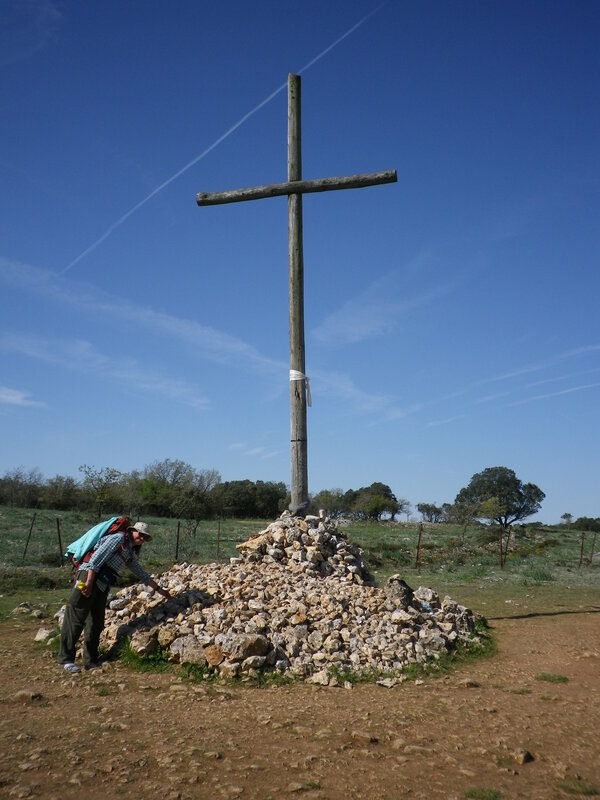 Where is the pilgrim confraternity which will take up this cross?